It helped her turn $5,000 into a billion-dollar business empire. Get it yourself — today — and find out what it can do for YOU! I could tell you that it contains the ultimate secret — so amazingly simple once you hear it — to having the one thing we all want. Happiness. Real happiness, minute by minute, day to day, year in and year out, no matter what is happening around you. We believe this program has the power to change your life. But don't take our word for it. Try it yourself! If it doesn't live up to your expectations for any reason, you can return it at any time and for any reason within 30 days of your purchase date for an exchange or a refund of the program price. It's as simple as that. 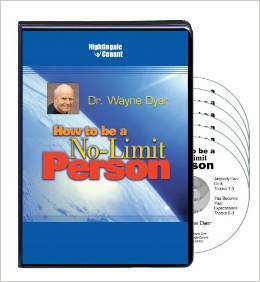 Please send me Dr. Wayne Dyer’s bestselling 6-CD audio program How to Be a No-Limit Person for just $39.95, which is $40 OFF the regular program price. Take advantage of this limited-time special discount now! This program is rated a PERFECT 5 STARS by Amazon reviewers!